This paleo spinach artichoke dip is a healthy take on the classic appetizer. 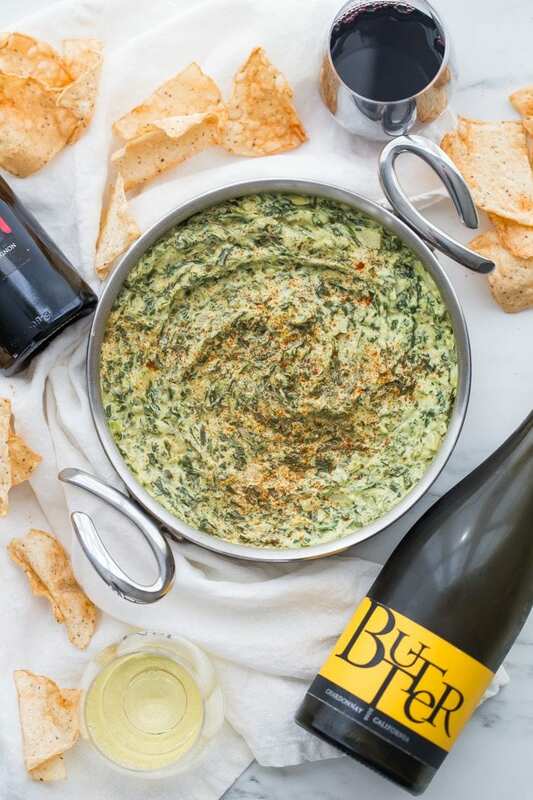 Rich and creamy, this vegan spinach artichoke dip is the perfect recipe for casual entertaining, especially in late summer and early fall. This paleo spinach artichoke dip is dairy free and goes perfectly with some paleo tortilla chips! One of my very favorite paleo appetizers, it really doesn’t taste paleo! I have this group of girlfriends, a few women who went to law school with my hubby. He introduced me to them years ago, and I promptly stole them away for my own. We get together regularly, not as often as we’d like now that we have husbands and kids, but we still make it a priority. We typically opt for potluck-style eating, making it easier than finding the right place to hang out and taking over a booth for hours. Oh, and the wine is way better, too, plus? We know how to pour a proper glass, none of this tiny-$19-glass nonsense. We love JaM Cellars wine because it’s the perfect mix of affordable and flavorful, rich and warming without being happy. A get-together with a couple bottles of JaM Cabernet and Butter Chardonnay will remind you to slow down and enjoy those last summer sunsets! 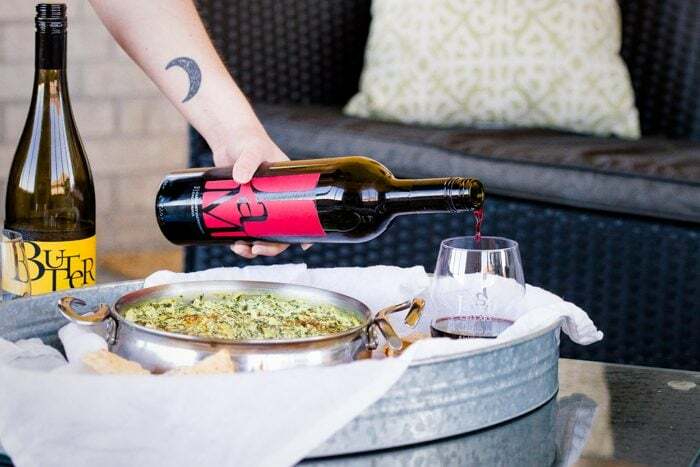 JaM Cellars make a few of my very favorite wines; they’re known for their easy-to-love California wines, including their JaM Cabernet, Butter Chardonnay, and Toast Sparkling. Both the JaM Cabernet and Butter Chardonnay are such crowd-pleasers and are under $20, easily found in a store nearby! Check out their reviews for Butter Chardonnay on JaMCellars.com or for JaM Cabernet on JaMCellars.com for inspiration. And the second thing? There’s one dish that almost always makes an appearance, especially if it’s late summer or early fall. I mean, can it get better? Creamy and cheesy + rich artichokes + tender spinach + crunchy tortilla chips? It’s filling and satisfying yet perfectly portable, making us, I’m sure, anything but unique. 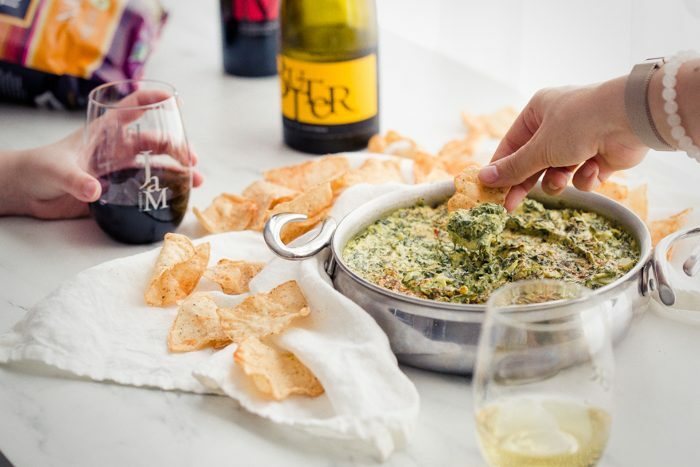 Let’s face it: spinach artichoke dip is the ultimate entertaining recipe. Except, you know, now we eat an almost entirely paleo diet, always opting out of cheese and corn chips, choosing plant-based options instead. There’s still time to take advantage of late summer and early fall entertaining. 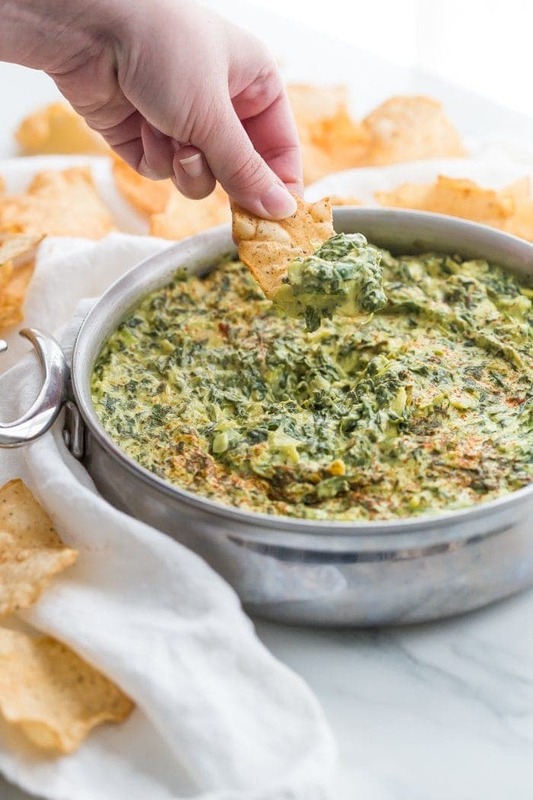 And this paleo spinach artichoke dip is the perfect solution. It’s easy and quite quick to make, letting your focus stay on hanging with your friends, drinking JaM Cellars wine, and reminding each other that we have to do this more often (We really do!). It’s rich and delicious, and I honestly wouldn’t be able to tell that there’s no dairy at all in it! With its base of almond yogurt and homemade mayo, it’s creamy and a bit tangy but will leave you feeling energized and light, rather than sluggish and overly full. 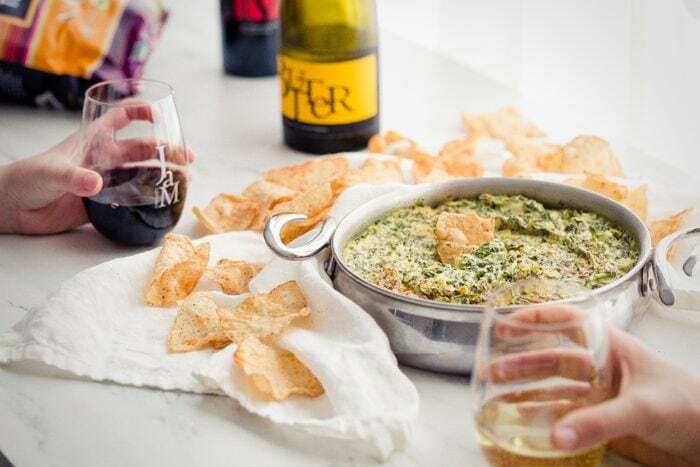 This paleo spinach artichoke dip is the perfect centerpiece for that late-summer bash, practically begging your friends to linger and snack for hours with their wine glasses. 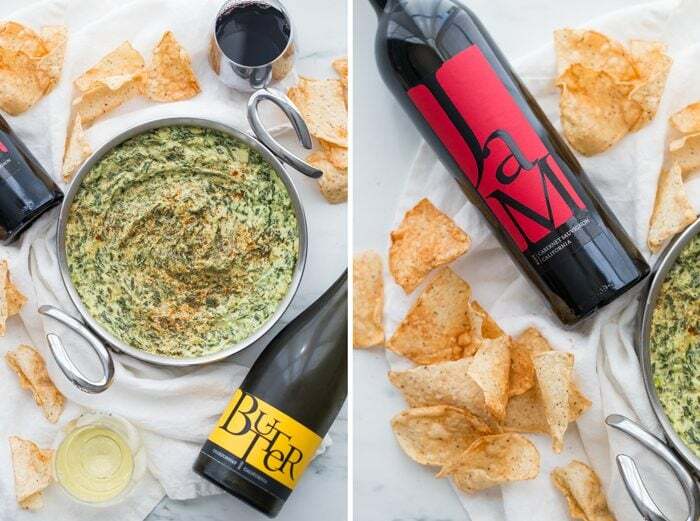 With a couple bottles of JaM Cabernet and Butter Chardonnay, this paleo spinach artichoke dip, and a few good friends, you’re set for that late summer, early fall get-together. Is there any better way to take advantage of these last few long days before it gets cold (and dark at 4 p.m., just saying!)? I think not! This paleo spinach artichoke dip is a healthy take on the classic appetizer. 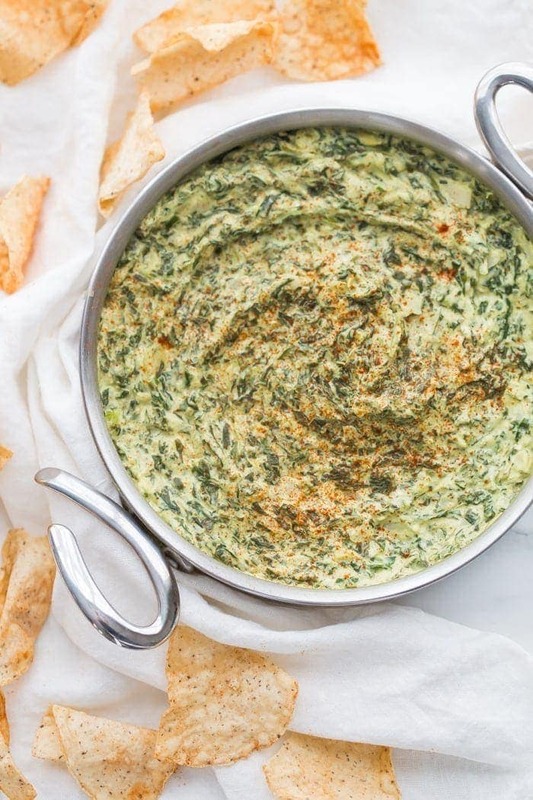 Rich and creamy, this vegan spinach artichoke dip is the perfect recipe for casual entertaining, especially in late summer and early fall. 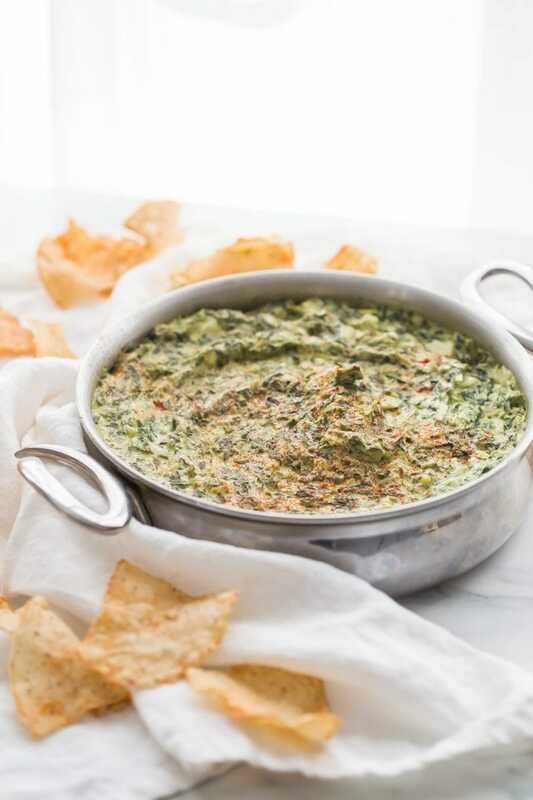 This paleo spinach artichoke dip is dairy free and goes perfectly with some paleo tortilla chips! One of my very favorite paleo appetizers, it really doesn't taste paleo! Heat ghee in a medium skillet over medium heat. When warm, add in garlic and stir constantly until fragrant, about 30 seconds. Add in spinach and artichoke and stir frequently until well combined and until remaining water from spinach has evaporated. Add in remaining ingredients and stir until very well combined. Taste and adjust seasonings as desired. Sprinkle with smoked paprika, if desired, and serve warm with tortilla chips. Enjoy with a glass of Butter Chardonnay or JaM Cabernet! Excellent rewarmed after a day or two! Delishious. It’s not easy finding DF dips that taste good! I used Yoso unsweetened yogurt (coconut yoghurt). Thank you; thank you! This was absolutely amazing. I was able to use fresh spinach (chopped well; because I needed to use it up), Kite Hill’s Greek Yogurt (plain and unsweetened), and two heaping tablespoons of soy-free Veganaise mayo. I also added half a packet of the organic spinach dip seasoning packet I found when searching for the ingredients. Delicious. You are so welcome!! I’m so so happy you like it! What kind of non-diary yogurt do you use? Almond, soy, coconut, cashew? You get plain right? Do you think it might be a good fill in for hummus, served cold? How long might it stay fresh on the fridge? Thanks! Umm, to be honest, I’m not totally sure. It would be quite thick, though I’m sure the flavor would still be very good! The dip I’ve been dreaming of! I mean, come on… who DOESN’T want a guilt free spin-artcihoke dip! ?